Does anyone else have a bag or two of dollar store pipecleaners on hand just in case? I love pipecleaners. They're so versatile, cheap, and they come in tons of colors. They're great for open-ended kid activities because they allow kids to be creative. This is a great make-anytime activity that you can do with minimal preparation. Pull this one out next time your kid says she's bored, or on a rainy day. Ages: 3 and up. Your 3 year-old will need help, but will probably really enjoy the end result! 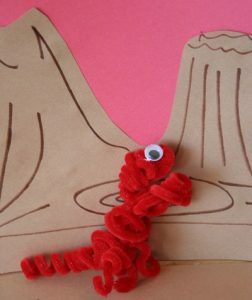 She'll like to coil pipecleaners around a pen, so be sure to let her do it along with you as you make one. Also, pipecleaners are easy to bend, so these toys won't last for long with younger kids, but it's still a fun activity. Connect three pipecleaners end-to-end, and wrap around your finger to create the body. Connect two pipecleaners end-to-end, and wrap half around a pen or pencil, overlapping the pipecleaner onto itself to create the head, and then coil the rest around to form the neck. Attach neck to body, by bending pipecleaner, or using glue if desired. 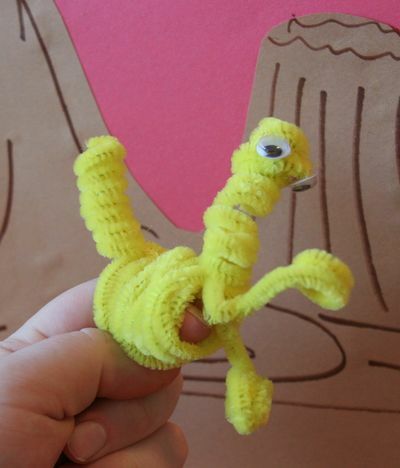 Coil one pipecleaner around pen or pencil to form tail, leaving about an inch straight for attaching to body. For arms, bend one pipecleaner into a V-shape, and coil each half around pen. Attach to body. If desired, create legs in a similar way and attach to body (we didn't make legs).